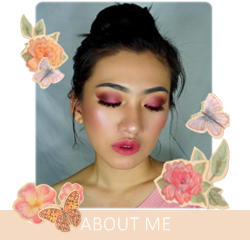 Hello there beautiful people, I have spent the last hours nurturing my sick dog, cleaning the house and yep you guessed it, making tutorial! As promised, I am going to post nail tutorial today. Lucky you, I keep my promise! You probably already know how to do this but I am going to post it anyway #likeaboss. Anyways, I am not really a big fan of manicure and I might have told you the reason why before but for those of you who don't, its because working doesn't encourage us having manicure. Its because of professionalism during work, I think. So I am more of a manicure person. Still, I am really excited to share with you guys how to make your own DIY newspaper/magazine etc nails. Whatever you might want to call it, its yours to decide. Lets get started. First, you will need all the supplies as shown in the picture. Typically, you will need the coat as well but some people don't use coats. I don't know why. It's really up to you as long as you have the basic supplies below. Once you have all the supplies, we can now proceed to the tutorial itself. I am sure the diagram can explain for itself but to make it easier for some people who prefer reading through the steps, here's how you do it. It's probably easier if you cut the newspaper first before proceeding to the nails but I kind of mixed up a bit but here's how I did it according to the diagram. I won't explain specifically according to the numbers but you'll get it. Don't worry. 1. Paint your nails with the color of you choice. I use Elianto's Thistle(35). Lighter color works better, I think. 2. 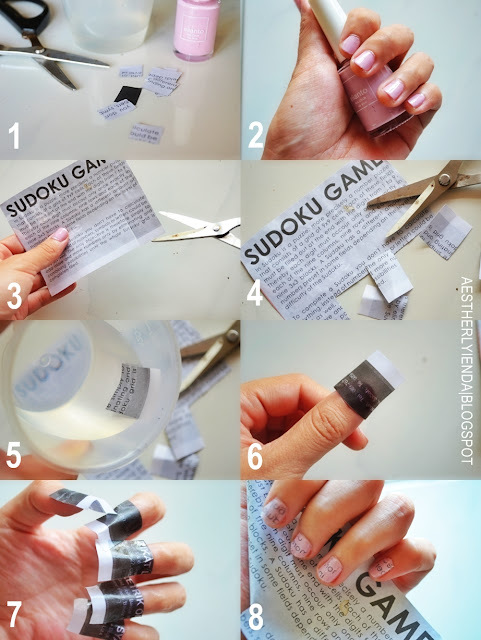 Cut the newspaper into tiny pieces so that it'll cover your nails. 4. You wouldn't want to leave it too long because it will cause the nail polish to smear. 5. Apply a generous amount of top coat to seal off your creation. ... and now you're done! P.s 1. You can soak your nails into the alcohol for a few second before pressing down the newpapers piece onto your nails. @Gee sangat easy right? Goodluck!